Clarksville, TN – With the passing of Dr. Gaines Hunt this past Friday, Austin Peay lost not only a longtime former professor and administrator, but someone who touched so many lives, both at APSU and across the country. A native of near-by Cheatham County, Hunt’s ties with Austin Peay go back to the early 1960’s – graduating in 1966 – and returning as a Professor of Agriculture in 1971, twice serving as the department chair, after earning his Master’s and Doctorate degrees at Mississippi State. For the next 35 years ‘Doc’ as he was called respectively by his many, many Ag-students and local farmers, helped lead the Agriculture Department growth, while making uncountable contributions over the years to not only the agriculture program and students, but to the local agriculture community as well. But his influence in the agricultural arena isn’t limited to local advancements, with several of his former students involved in several advancements in agriculture, most notably Lannett Edwards, who made headlines nationally and inter-nationally for cloning Dolly the sheep in 1996. 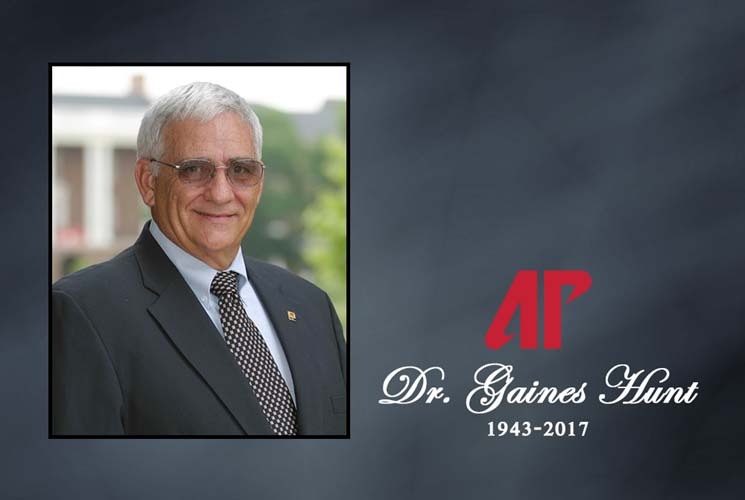 After retiring as a professor, a group of his former students met to establish the Dr. Gaines Hunt Endowed Scholarship in Agriculture, raising over $32,000 in just a couple of months. Hunt also served as dean on several occasions, including the College of Arts and Sciences and College of Science and Mathematics, as well as Administrator of Professional Programs and Assistant Vice President for Academic Affairs as Dean of Graduate Studies and Professional Programs as well as Director of Fort Campbell Programs. Hunt was also instrumental in getting an Alpha Gamma Rho Fraternity chapter on the APSU campus by convincing the AGR National Office to change some of its standards required to earn chapter status after the then local colony had worked for 10 years to gain said status. But Hunt’s legacy isn’t just limited to academics and Alpha Gamma Rho, he was also integral part of many phases and segments of the APSU Athletics Department from Governors Club, APSU Hall of Fame Committee and Red Coat Society. For over 15 years Hunt was the APSU Facility Athletics Representative, serving on several key committees over the years – including being APSU’s NCAA delegate in 1981 that passed a plan to allow women to compete for NCAA championships, which began two years later. He was also on the OVC subcommittee that created the OVC Scholar-Athlete Award, the first OVC ‘Sportsmanship Statement’, which became the role model that other NCAA conferences have followed since. Hunt was also handpicked by former APSU President Oscar C. Page to head the school’s NCAA Basketball Recruiting Investigation and Response in which he prepared a 460-page document in response to charges. It was at the time believed to be the first occasion an institution self-imposed penalties as a result of major violations and considered by the NCAA as the internal investigation and response standard for future investigations. Among his honors for his time at Austin Peay was the OVC’s Thurston Banks Award in 2015 for outstanding contributions to OVC student-athletes’ academic success, learning and development as well for his or her overall commitment to the institution’s athletics program and to the OVC Hall of Fame in 2016. For over 40 years Hunt left his mark on Austin Peay in the classroom, Greek Life and athletics. While he may no longer be with us, his legacy will live on for many generations to come at Austin Peay.